A central challenge in macroeconomics and asset pricing is understanding the impact of monetary policy on long-term real and nominal interest rates, including the channels through which these effects occur.1 The effectiveness of monetary policy, however, does not solely depend on the control of short-term interest rates, but also on central banks' ability to shape market participants' beliefs. Central bank communication has emerged as a key tool for controlling those beliefs. In a recent paper, we provide direct evidence that monetary policy affects long-term rates not only through expectations of future short-term rates, but also by influencing the risk premium investors require to hold long-term bonds (Leombroni et al. 2018). This effect is mainly induced by the central bank’s communication about their own assessment of the state of the economy. Consider Figure 1,which displays cumulative changes in two-year yields for core (average of Germany and France) and peripheral (average of Italy and Spain) bonds only on days when the ECB announces its new monetary policy. The plot shows that between the years 2001 and 2009, core and peripheral yields moved one-for-one in response to policy shocks, but post financial crisis, yield changes became disconnected, often moving in opposite directions, and resulting in a considerable yield spread of up to 80 basis points (bps). This is surprising given that this spread emerged during a period when unconventional measures were being implemented to reduce it. To capture the effects of central bank communication, we exploit an institutional feature of the ECB which allows us to decompose monetary policy surprises into target and communication shocks. Most central banks inform the public about their monetary policy decisions, but the ECB is special in releasing a brief press statement with the current policy decision and holding a separate press conference 45 minutes later on the day of the Governing Council meetings.3 Hence, the institutional details of the ECB allow a decomposition of intraday changes in the euro area money market rates into news related to the level of the ECB policy interest rate (target rate shocks), and news related to the future path of monetary policy or the economy more generally (communication shocks). With the two shocks in hand, we document a number of novel results. First, target rate shocks affect bond yields almost one-for-one at the short end of the yield curve but have little impact on long-term yields. 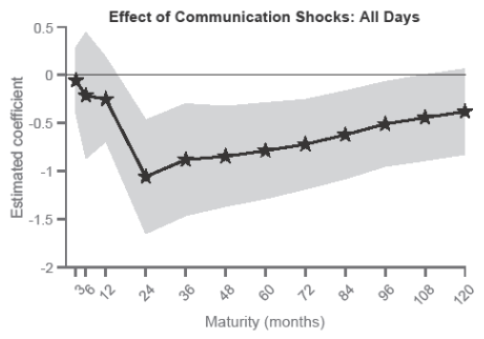 Communication shocks, however, have large effects on bond yields, being most pronounced for intermediate maturities but also having a significant impact at long-term maturities.4 Comparing their joint impact, we show that almost all explained variability in bond yields on ECB days is due to communication. Second, splitting the sample into the pre- and post-crisis periods, we find that while before 2009 monetary policy shocks affected bond yields of all euro area countries uniformly, after 2009 a differential effect of communication shocks arose between core and peripheral yields. Specifically, we show that post crisis, peripheral yields' response to communication shocks became muted, whereas core country reactions were unchanged. 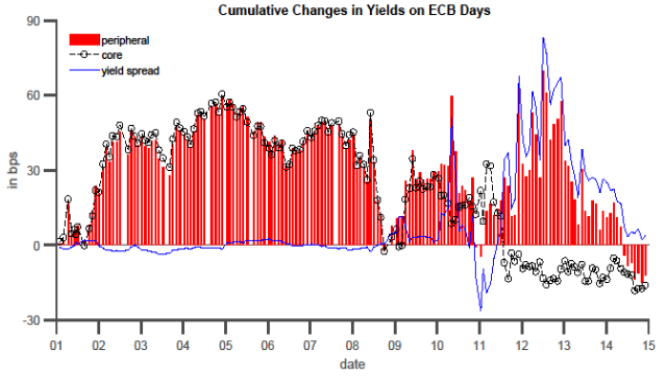 Combining this observation with the fact that communication shocks were mostly negative post-2009 – that is, the market had expected higher future short rates than what the ECB then signalled – we show that, as a response to these shocks, yields went down in core countries considerably, whereas peripheral countries' yields were basically unaffected. As a result, communication is responsible for a significant wedge that, at its peak around the end of 2011, represented 20% of the total two-year yield spread. This effect is illustrated in the top panel of Figure 2, where we plot estimated coefficients (together with the 90% confidence intervals) from a regression of the yield spread between peripheral and core countries on the communication shock in the post-2009 period. We note that yield spreads are significantly affected by communication shocks for almost all maturities. Dovish communication shocks hence increase yield spreads. Third, we attribute the heterogeneous effect of communication shocks on core and peripheral countries to an emergence of a risk premium that affects peripheral bond yields more than core countries' yields. By promising to keep interest rates low for an extended period, central banks can signal bad news to the market and this influences peripheral countries more than core countries. To identify days when the ECB reveals information about the economy to the public, we rely on high frequency movements of stock returns in a tight window around the announcement. Standard theory predicts that tighter monetary policy should lead to a stock price decline and a contraction of economic output (e.g. Bernanke and Kuttner 2005). In contrast, tighter monetary policy that is accompanied by an increase in stock returns can lead to improved financial conditions (e.g. Jarocinski and Karadi 2018). We therefore use the high-frequency co-movement of stock returns and communication shocks to disentangle signalling days (positive co-movement) from non-signalling days (negative co-movement). Using this indicator, we find that while communication shocks affect yield spreads between peripheral and core countries on average, the effect is significantly more pronounced on signalling versus non-signalling days. This indicates that signalling future accommodating monetary policy can be interpreted as an expression of the ECB's pessimistic view, which leads to an increase in the yield spread. 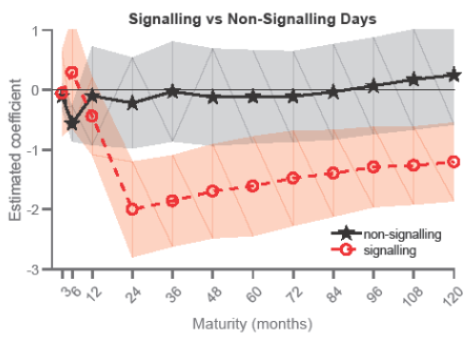 Indeed, we illustrate this intuition in the bottom panel of Figure 2, plotting the estimated regression coefficients from yield spreads on the communication shock on signalling versus non-signalling days. Notice that signalling days lead to a significant spread between peripheral and core countries’ bond yields in response to central bank communication, whereas on non-signalling days the wedge is insignificant. To test this hypothesis, we explore the effect of communication shocks on proxies of bond market illiquidity, credit default swaps, and credit default swap quanto spreads, the latter proxying for redenomination risk. Using linear regressions, we find that the ECB's communication significantly increased the credit, redenomination, and illiquidity spreads between peripheral and core countries on signalling days. Our results thus show that, by conveying the central bank’s perception of the state of the economy to the market, ECB communication contributed to an emergence of risk premia in peripheral yields, dampening some of the effect of its accommodating monetary policy. Central bank communication can have real consequences. Our study is a first step towards studying the effects of central banks’ information channels on risk premia. As central banks attach greater importance to communication, more empirical and theoretical work is needed to understand the consequences not just for asset prices but also real macroeconomic quantities. Bernanke, B S (2017), Monetary policy in a new era, Rethinking Macroeconomic Policy, Peterson Institute. Bernanke, B S and K N Kuttner (2005), "What explains the stock market's reaction to federal reserve policy?" Journal of Finance 1221–1257. Gertler, M and P Karadi (2015), "Monetary policy surprises, credit costs, and economic activity," American Economic Journal: Macroeconomics, 44–76. Gilchrist, S, D Lopez-Salido and E Zakrajsek (2015), "Monetary policy and real borrowing costs at the zero lower bound," American Economic Journal: Macroeconomics, 77–109. Hanson, S G and J C Stein (2015), "Monetary policy and long-term real rates," Journal of Financial Economics, 429–448. Jarocinski, M and P Karadi (2018), "Deconstructing monetary policy surprises: The role of information shocks", ECB Working Paper Series 2133. Leombroni, M and L H W Nielsen (2015), "The impact of the ECB’s monetary policy stance on long-term rates", Goldman Sachs European Economics Analyst. Leombroni, M, A Vedolin, G Venter and P Whelan (2018),Central bank communication and the yield curve,Stanford University, Working paper. Nakamura, E and J Steinsson (2018), "High frequency identification of monetary non-neutrality," Quarterly Journal of Economics, 1283–1330. Praet, P (2013), "Forward guidance and the ECB", VoxEU.org, 6 August. Woodford, M (2009), "Comment on ‘Heeding Deadalus: Optimal inflation and the zero," Brookings Papers on Economic Activity. A large literature argues that monetary policy shocks, as measured by high-frequency movements in short-term interest rates, have surprisingly large effects on long-term interest rates. While Gilchrist et al. (2015),Gertler & Karadi (2015),and Hanson & Stein (2015)argue that monetary policy primarily works by affecting term premia, Nakamura & Steinsson (2018), among others, suggest that the response to policy surprises reflects the fact that nominal rigidities are far stronger than assumed. Reinforcing this idea, Peter Praet, Chief Economist of the ECB, argues that the ECB's communication can contain both components simultaneously. For example, he argues that the ECB Governing Council's announcement that interest rates will remain at lower levels for “an extended period of time” is becauseit anticipates that economic conditions will remain such as to justify an exceptional degree of monetary accommodation (Praet 2013). The US Federal Reserve introduced press conferences on a quarterly frequency in 2011. Leombroni and Nielsen (2015) also find that the ECB’s monetary policy stance affects long-term swap yields. Ph.D. student in Economics, Stanford University.